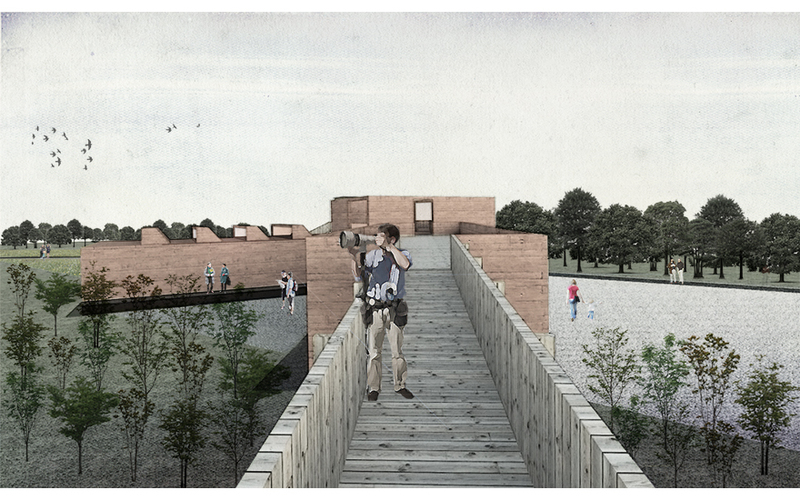 The competition site is a gateway for arrival and departure into new and ancient woodlands, which we seeked to capitalise upon by proposing contrasting monolithic elements set within a landscaped corridor. The proposal has many personalities and creates multiple opportunities for the visitor to explore the habitats that surround the site. The location of the proposal on the site is such that it allows for a dramatic entrance sequence between old and new woodlands. The visitor first views a lightweight walkway originating from deep within the woodland leading to heavyweight monolithic walls. 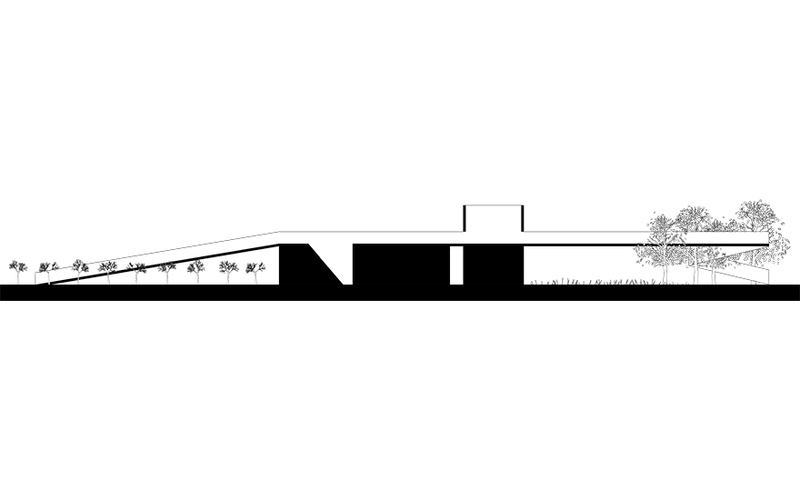 The proposal is a series of linked buildings and courtyards, much like the nearby farmsteads. 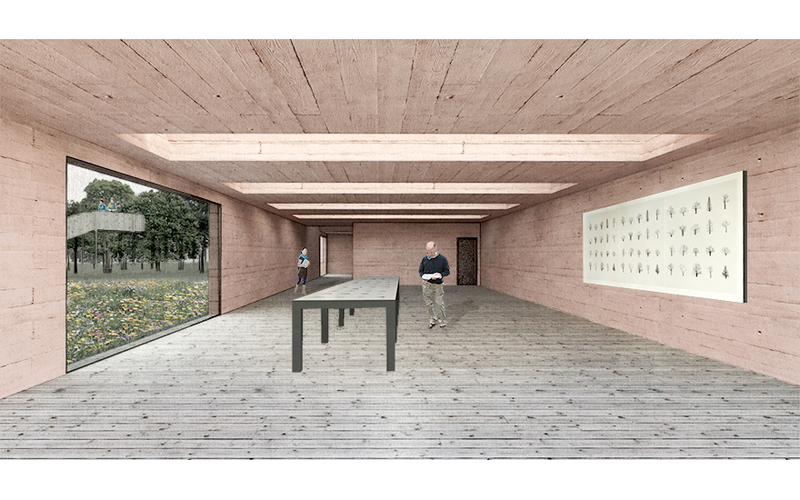 Externally, the scheme seeks to bridge the surrounding woodland by way of a elongated timber walkway to a landmark Hub set within distinct landscaping. 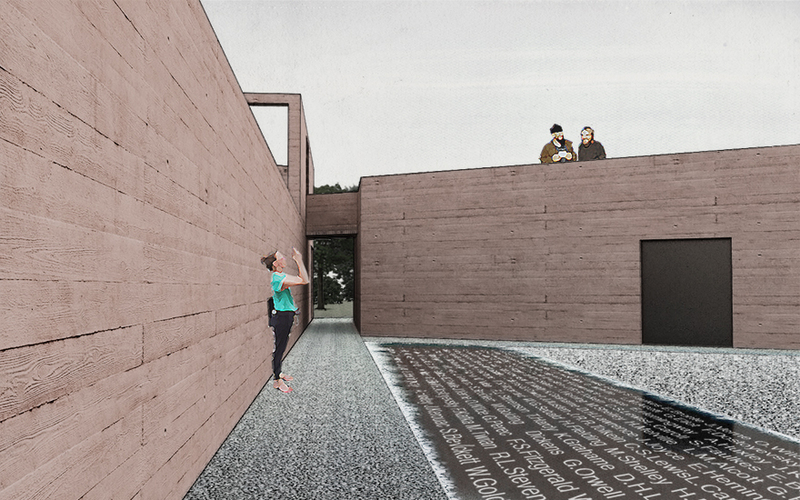 The journey from arrival leads to a reed bed which diffuses into an extensive gravel courtyard allowing for the in-situ concrete walls of the proposal to embrace the visitor in approach to the entrance and providing a stark contrast within the context. The landmark entrance tower draws the visitor to the punched opening of the entrance courtyard, leading to internal views to the wildflowers beyond. Additionally, the tower provides a viewing platform. A further journey is created through a narrow passageway between the main building and the public toilets to a water memorial where the names are projected onto a shallow pool. 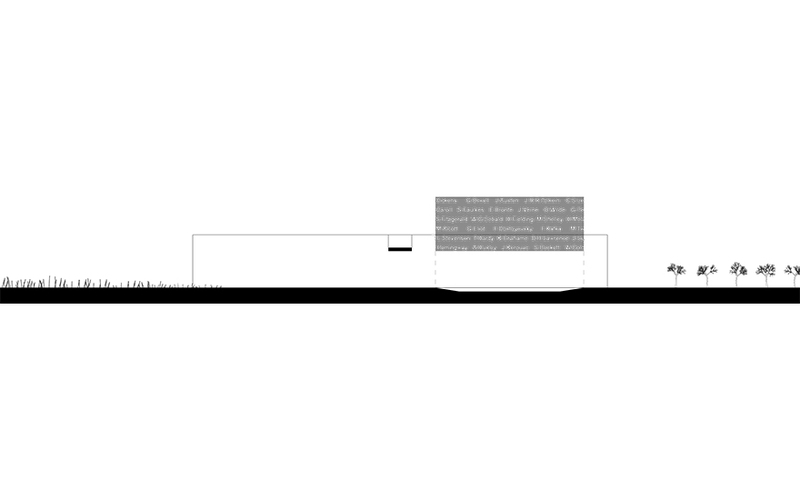 The internal configuration of the proposal is separated into two components which include the main building, which contains the entrance, office, kitchen and gallery spaces; and the ancillary building which includes the storage space and public toilets that are accessible when the hub is closed. 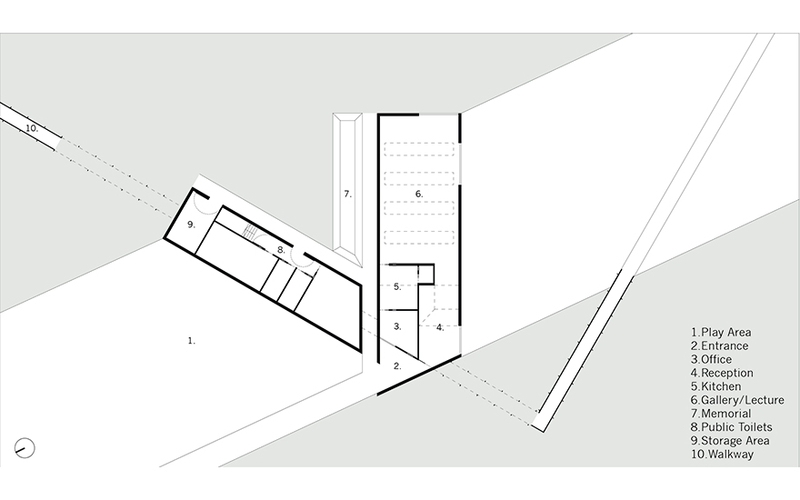 The tower acts as a solar chimney pulling air through the main building via cross ventilation. Solar panels on the roof of public toilet would heat water for the proposal. 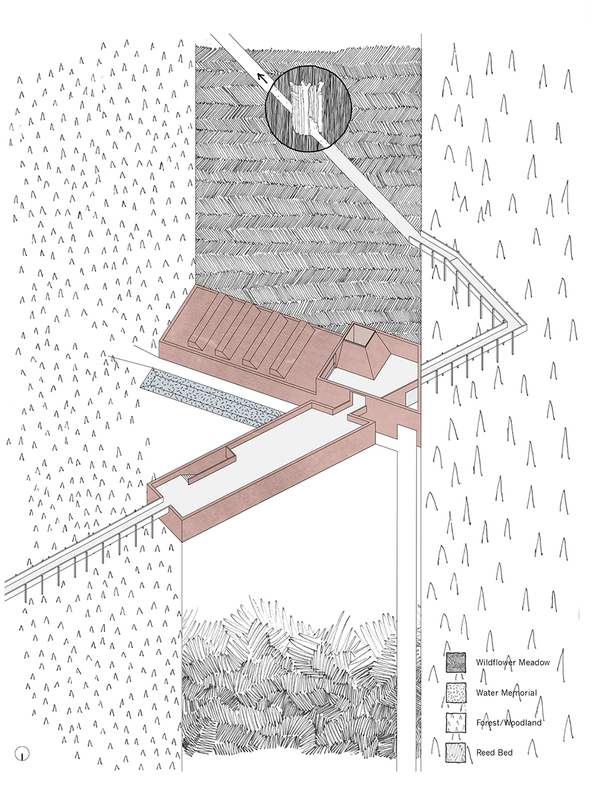 In-situ concrete with the appearance of a rammed earth wall is chosen to provide a strong contrast with the surrounding woodland, with a suggestion of the trenches omnipresent on the battlefields of WWI. 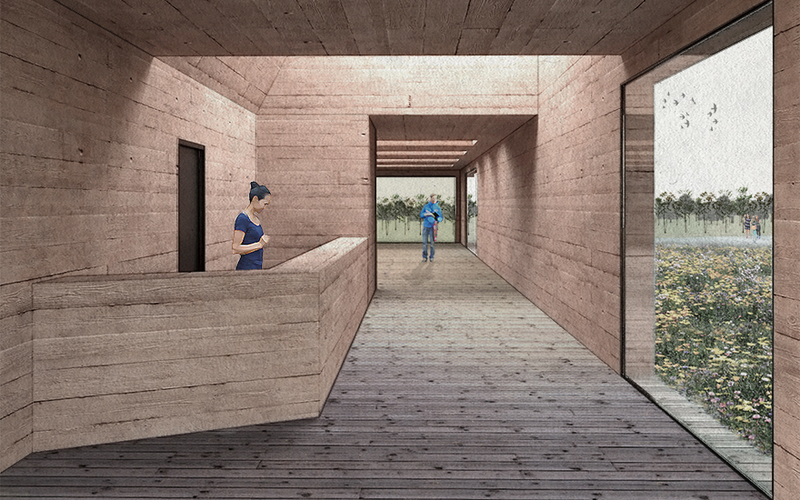 Horizontal orientation and texture of the in-situ concrete walls and ceilings would be from rough sawn timber boards, using locally sourced timbers. The timber boards from the formwork would be used for the floors, doors and internal joinery elements. Furthermore these formwork boards would be used for the timber walkway. 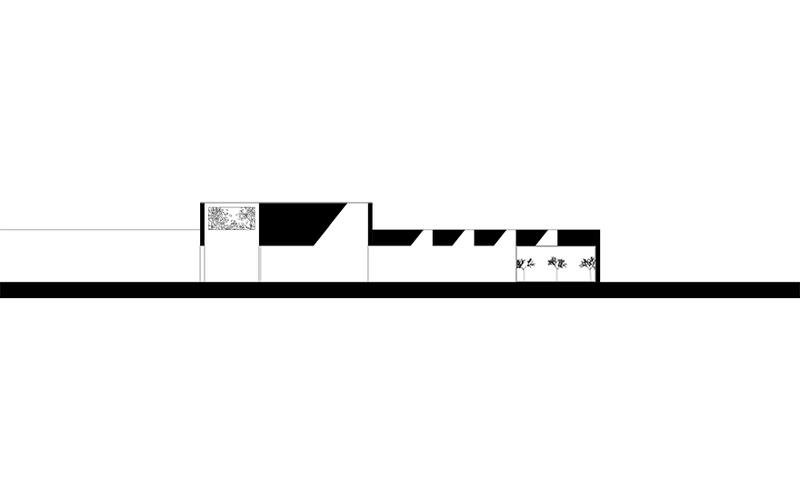 The siting of the proposal is to allow for future amplification to the south, potentially a café. Employing a restrained material palette provides economic benefits by way of economy of scale. The timber used for the formwork of the in-situ concrete walls would then be used for the joinery elements as noted above. The ‘as struck’ finish minimises external and internal finishes costs.